Adventurous hikers have some spectacular sights to explore in the Porcupine Mountains and Ontonagon County. The region has an abundance of wild waterfalls, including many that can be reached via hiking trails—when there’s snow, they are great to explore on snowshoes. Here are three destinations that are beautiful locations for a waterfall hike. The wild Black River plunges over volcanic rock on its wild journey to Lake Superior. There is an assortment of falls that you can explore on the Black River, including Great Conglomerate Falls, Gorge Falls, Potawatomi Falls, Sandstone Falls and Rainbow Falls. They are great to explore by snowshoe in the winter, and in warmer months, hikers can access viewing spots for each set of falls. The Black River Scenic Byway (County Road 513) will gives you easy access to all the falls along the route. The byway dates back to the 1840s—it was once a wagon road. You’ll find a breathtaking hike about an hour south of the Porcupine Mountains. This impressive cascade on the middle branch of the Ontonagon River has a drop of about 50 feet; in cooler months, the water sometimes creates interesting natural ice sculptures. There’s a trail that loops the falls—it’s about a mile long. Dogs are allowed on the trail. On the west side of the Porcupine Mountains Wilderness State Park, you’ll find a collection of three scenic falls—Nawadaha Falls, Manido Falls and Manabezho Falls. In the winter, some area access roads are closed but backcountry adventurers can still make their way to the falls by snowshoe. There’s a 2.3-mile loop around the falls that offers nice viewing spots. 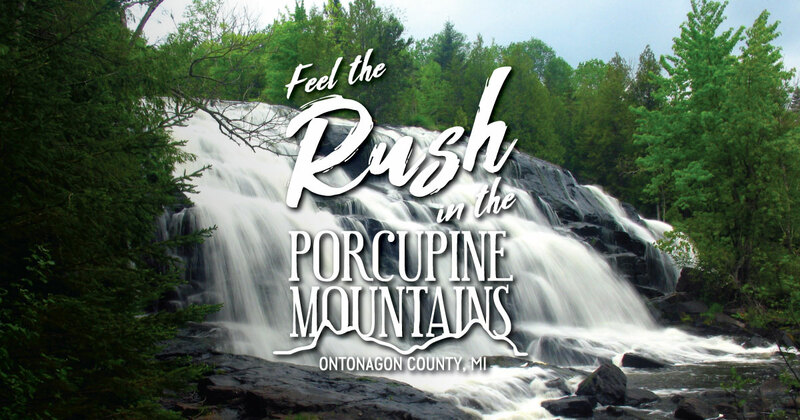 Learn more about waterfalls in the Porcupine Mountains.